When I decided to learn Java mapping, I searched SDN for blogs on Java mapping and found lot of blogs. Some of them were too technical and some of them given only coding and nothing else. As a developer, who did not have Java background, I found it very difficult to follow those blogs. So, I decided to come up with this blog post for beginners, which will give a basic understanding of how to write a Java mapping program. A typical Java mapping program takes the incoming XML message and transfers the data into target XML message structure. To do this the Java program first needs to read what is there in the incoming XML message. This is done by parsing or breaking down the XML document into individual elements. The subject of this blog is SAX so I am going to concentrate more on SAX parser. Called when the Parser starts parsing the Current XML File. Called when the Parser Completes parsing the Current XML File. Called when the starting of the Element is reached. For Example if we have tag called <Title>...</Title>, then this method is called when <Title> tag is Encountered while parsing the Current XML File. The AttributeList Parameter has the list of all Attributes declared for the Current Element in the XML File. While Parsing the XML file, if extra characters like space or enter characters are encountered then this method is called. If you don’t want to do anything special with these characters, then you can normally leave this method blank. So this method can be used to read the values or body of the elements. When the java program takes this message as input, as soon as system reads the first line (i.e., <?xml version="1.0"?> the startDocument() method is called then system reads next element <doc>, now the startElement() method is triggered, next the method is called again for <para> element. Now as the element <para> contains some body, characters method is called. After that system reads </para>, which is end of the element <para>. At this point system calls endElement() method. Again system calls endElement(), but this time for </doc> element. Finally endDocument() method is called when there are no elements left to read. The SAX parser is also called event driven parser because it invokes the methods ( startDocument(), startElement() etc., ) as it reads the XML document. With in jdk folder you have bin folder, which contains all the java executable files. After doing this download the aii.map.api.jar file and place it in bin folder. Add the path c:program filesjavajdk1.6binaii.map.api.jar to the CLASSPATH environment variable. The first thing we need for creating any mapping program is to create two message interfaces. So let’s start and create the data types , message types and message interfaces. I am not going to explain here in detail how to create them as it is very simple and straightforward. Any user working in XI or got trained should be in a position to do that. 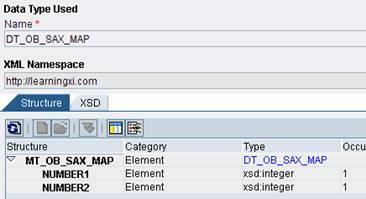 The data type DT_OB_SAX_MAP contains two elements NUMBER1 and NUMBER2. 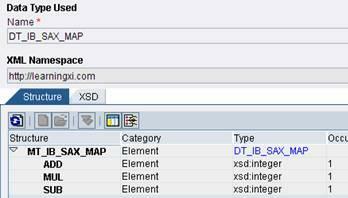 The data type DI_IB_SAX_MAP has three elements ADD,MUL and SUB. The aim here is to take the two numbers and add , multiply and subtract them and pass the results to the respective elements in target message. 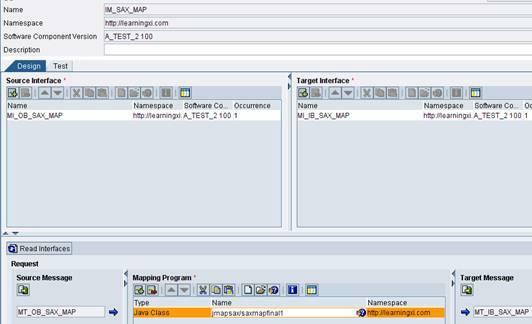 Before creating the interface mapping, we need to create the Java mapping program. We will first examine the source and target XML message structure. The message has three elements MT_OB_SAX_MAP, NUMBER1 and NUMBER2. 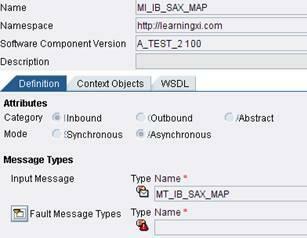 As you see from the above XML structure, we have total four elements MT_IB_SAX_MAP, ADD, MUL and SUB. When the parsing of XML message starts, first startDocument() method is triggered as soon as program encounters the line <?xml version="1.0" encoding="UTF-8"?>. so we will call write() method by passing the <?xml version="1.0" encoding="UTF-8"?> to argument “s”. The write() method writes this string to the OutputStream. 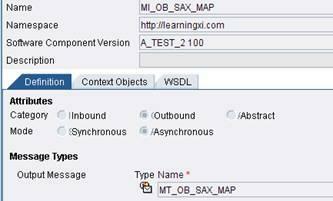 Similarly we will also pass the string <ns0:MT_IB_SAX_MAP xmlns:ns0="http://learningxi.com"> to write() method. In between these statements write(LineEnd) is used to introduce a newline. At this point we calculate the values for ADD, MUL and SUB elements and call the write() method to write these elements to the OutputStream out. Now place the java file in a folder with name jmapsax ( this is package name we have specified in the java program). Compile the program and zip the java file and generated class file. Create a new imported archive and import the zip file. click the test tab in the interface mapping and enter some integer values for NUMBER1 and NUMBER2. click on execute you will see the target message. Great Job Indeed..Keep it UP ! ! ! What if everyone in the world explains the things/concepts as clear as this article explains about Java Mapping, without any doubt everyone would have been educated very easily without any pain. Great work. I also confused like you before. Now I got full idea.Keep it up. Do you think it is mandatory to extend the class DefaultHandler in all Java Mappings? Can I not by-pass it? Your Blogs are great ! I just wanted to say ‘thank you'” for your wonderful and clear explanation of Java mappings. Great Job! Great one. clearly explained. well done. Thanks a lot for your clear explanation on java mapping.. It helped me a lot .keep it up.Hope u post more articles …..
You are great. Keep posting more stuff. I think you just made my day. Thanks for a great job. are written in the output ?? with the Code you Provided where exactly it tells the system to create Output elements. Is this code missing ? SAX parsing is event-based, so you wont find individual node names. The code is complete. Please try it out yourself so as to understand it better. The parse method parses the input xml document. Different methods like startDocument(), startElement() are invoked at appropriate events. The code within these methods is used to genrate the output document. I have seen so many blogs for Java mapping,but this Blog is the best blog . u guys are doing gr8 contribution. really appreciable. I am verymuch new to java. I was able to understand the whole stuff though , even as a beginner. But, i have simple question. How do we get into java editor for creating mapping program & testing it. After installing jdk, how do we get into java editor. You will need to install a Java development environment e.g. Eclipse or NWDS (NetWeaver Developer Studio). when i test my mapping program. Make sure your mapping class file and all Java libraries used by the mapping program are present in repository. You can import all required libraries as separate imported archives in IR/ESR. Please test your mapping program locally before importing into IR/ESR. This should help you resolve the issues. Most likely you are missing out on closing some XML tags. I get the results XML NOT WELL FORMED on the receiver side, the sender XML is fine as XI produced the XML and i send it thru some WELLFORMEDNESS software i down loaded. I debugged the program that is identical to the one you supply in your example with your exact mapping and it is failing in the very start at STARTDOCUMENT throwing an exception(prints two blank lines) and then failing to produce any XML , XI displays XML NOT WELL FORMED . Any ideas, do i need to do some preliminary setup or any kind ? XI does most the work, please advice. Can you please explain in similar way how to parse and work with DOM. where did you “in code” setup elements () of message and its values ?